PLIDCO® Weld+Ends, a safety welding coupling for crude oil, gasoline, gas, asphalt, steam, chemical process and other pipelines, joins pipe so that flow can be resumed immediately at pressures shown in table below. No special preparation of pipe ends is required. Just cut the pipe and slide the PLIDCO®Weld+Ends coupling on. With clamping and thrust screws fully tightened, pipe is joined and leakproof seals are completed. PLIDCO® Weld+Ends coupling can be left with screws tightened or they can be welded. The safest condition for welding on a pipeline is with the line in operation. If welding is specified, it can be delayed for several weeks until conditions are safe–with pipeline in operation. If welding is specified, the pipeline can be in operation. Refer to the chart below for recommended pressures. Thrust screws are cut/burned off flush. 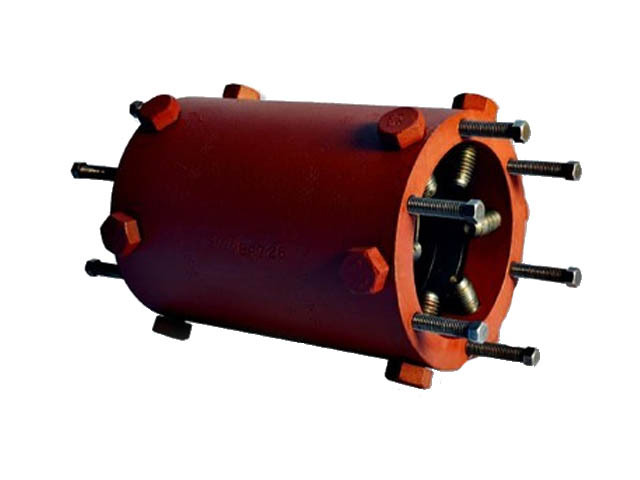 The end of coupling is fillet-welded around circumference, including seal-welding of the thrust screws. The clamping screws are cut/burned off and seal-welded. Standard PLIDCO® Weld+Ends couplings have a single row of clamping screws at each end. Where excessive end-pull loads are involved and it is not feasible to weld, additional rows of clamping screws can be provided or the PLIDCO® Clamp+Ring may be used. Available in standard sizes from 1-1/2” through 48”. Special sizes, diameters, pressures and lengths, on application. Buna-N packing is standard. Other packing available. Standard body materials: 1-1/2” thru 2-1/2”, seamless mechanical tubing; 3” and up, A-106 seamless pipe, A-105 forging, A-285, A-516, steel plate or equivalent. *Pipe not anchored: A joint in which the pipe ends could move when subjected to internal or external forces, such as internal pressure, temperature expansion and contractions, underwater currents, ground movement or any combination thereof. Working pressure for “Pipe Not Anchored”: sizes 1-1/2” thru 3” is based on wall thickness of Schedule 80 pipe and heavier; 4” and larger, on wall thickness of Schedule 40 or 1/2”, whichever is less. Anchored pipe: A joint in which the pipe ends would not move when subjected to these same forces. If the PLIDCO® Weld+Ends Coupling is welded according to our instructions, or a suitable PLIDCO® Clamp+Ring is used, it can be considered an anchored joint.